Evening visit until 11.30pm close. Thornbridge / Thornbridge Hall - Jaipur 5.90 Back to the form I recall when it first came to the market perhaps? Lunchtime. Didn't note all the beers on offer. Rockin Robin - Mildly Rockin 3.70 Straight from the barrel, just waiting for a hand pump to become available. Banks's - Feral Hop Hog 5.60 Just slightly too sweet. Evening. Many faces familiar after the exodus from One Inn The Wood Micropub's closing time earlier. Lunchtime. Otter's Progress coming soon. Adnams - Golden Road California Breakfast Ale 4.80 Not Tried Had a little taste, not for me. Coffee in a pale ale? 14:00 Another new pub for me. Good choice of beer as it was London brewers week. I can recommend the Chicken Balti. Lunchtime, Adnams/Mateo & Bernabe Birra Armada available soon. Kissingate - Ruby Plum Porter 4.80 Far too sweet for me. Thornbridge / Thornbridge Hall - Kipling 5.20 Perfectly clear. Thornbridge / Thornbridge Hall - Hopton 4.30 ...but slightly hazy. 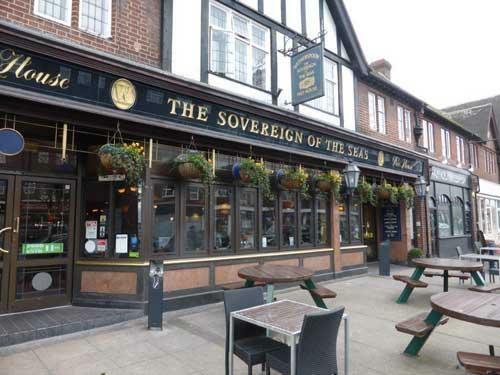 The pub is found in Petts Wood, Greater London, BR5 1DG. 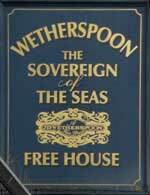 This Wetherspoon pub is located in Petts Wood's Queensway. Petts Wood is named after the Pett family. For more than 200 years they were the country's leading shipbuilders. In 1634, Phineas Pett designed Sovereign of the Seas for Charles I. The finest ship of her age, she sailed the seas until catching fire in 1697. Large inside and the bar sports 12 handpumps in 2 banks, each of 6. We have visited this pub 168 times, seen 521 different beers and tried 354 of them.